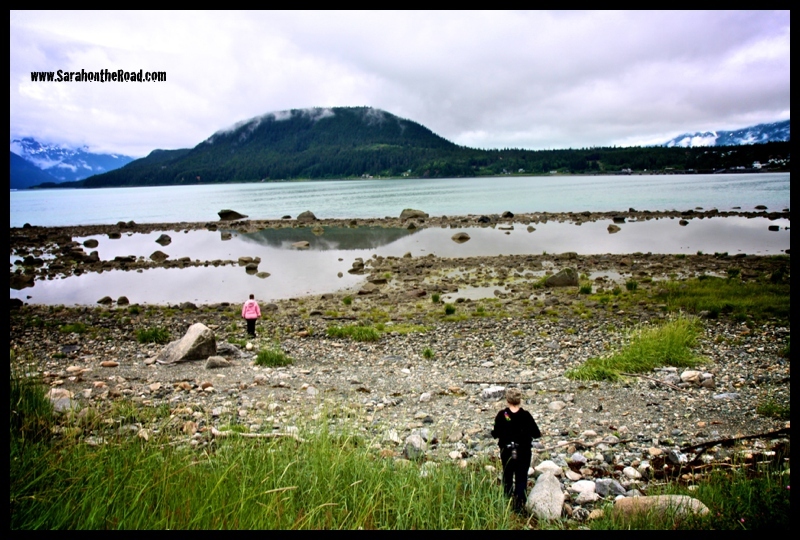 …after getting off the ferry we booted into Haines to see what we could find. 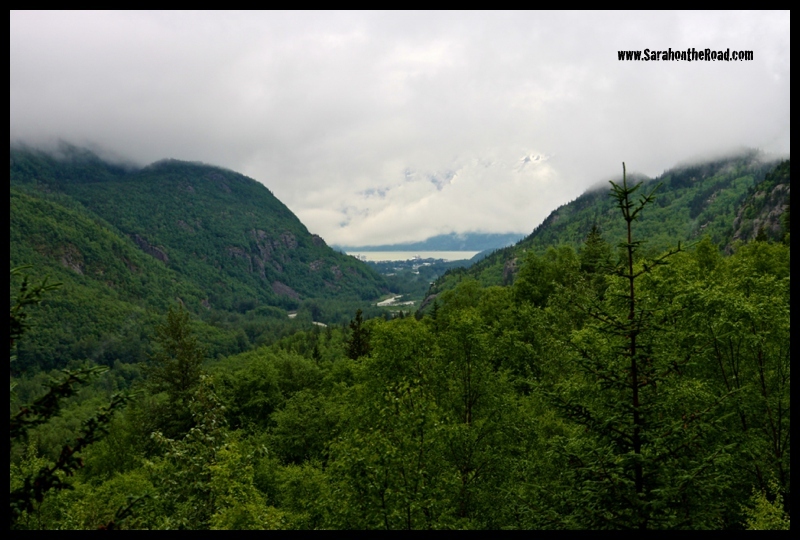 The fog/mist was low in the sky covering up most of the mountains…but it was still so breath-taking! We found a restaurant just by chance. We were driving around and found this awesome store that sold smoked salmon… and beside it was a restaurant called the Fireweed. We went up to look at the menu outside… and were going to leave but a man delivering beer from the Haines Brewery talked to us. He basically said we should go in.. and we did. It was the BEST decision EVER! 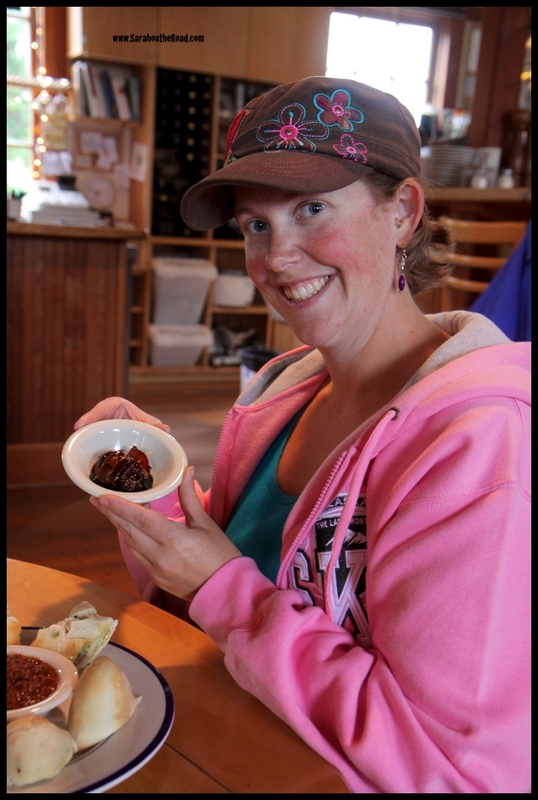 If you ever get to Haines… you NEED to eat here! 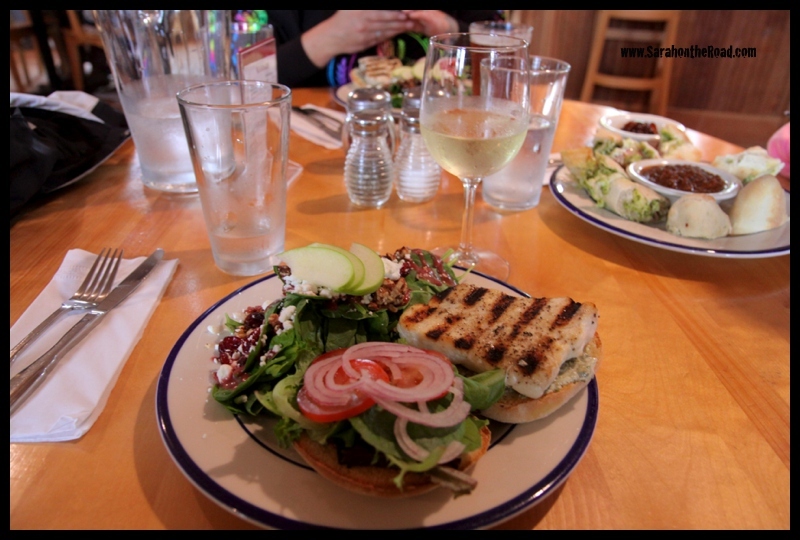 I had a Halibut burger..with a HOMEMADE bun… so yummy! 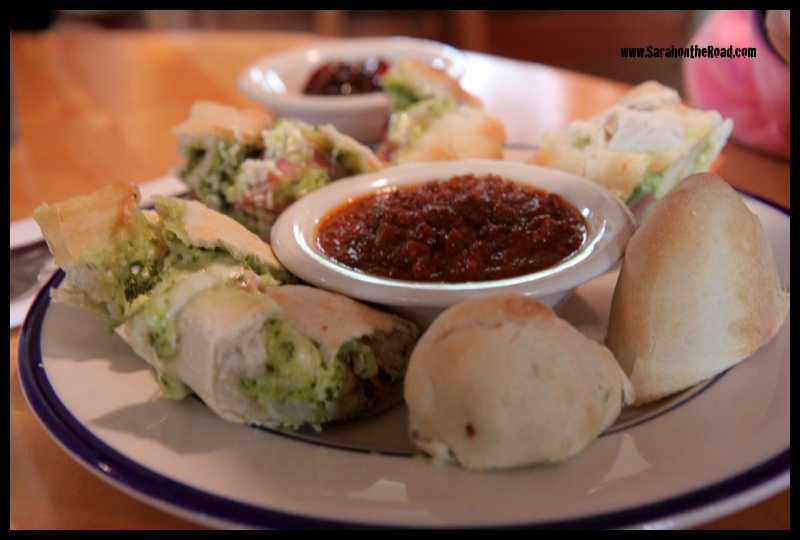 Kara had these awesome things…stuffed with goat cheese, prosciutto, and pesto…. so yummy! …don’t forget the bacon wrapped date! Kara, Jen and I shared these 2 desserts… so yummy… mine was a lemon thingy.. that was so tart but sweet… and Kara got the tiramisu! Our site for the night… nice warning! 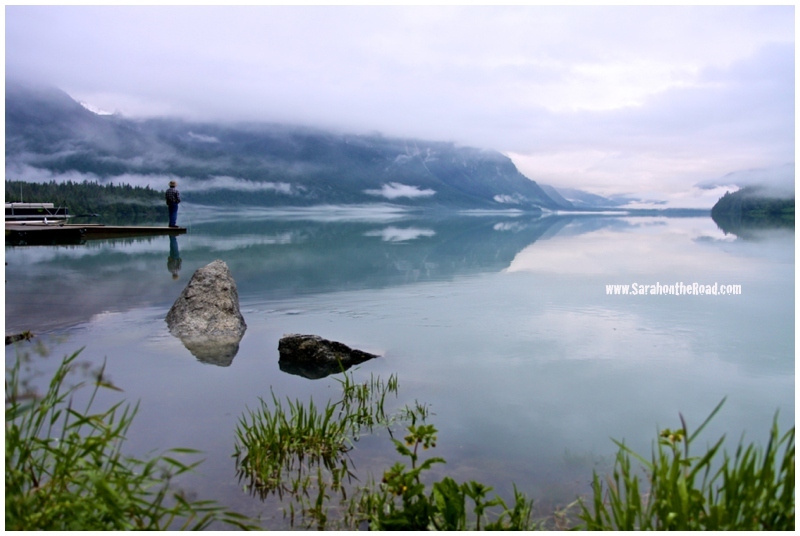 …this man was fishing, didn’t catch anything…but so peaceful. The next day we drove by and it was so choppy and not like this at all. Jen and I were lucky to catch it this way… at the right time of day! The fog is covering a lot of the mountains..but I love this photo because it shows such perspective of how awesome this area is! Just before we headed back to our camp for the night a random couple came up and I took their photo. Then they offered to take one with Jen and I… the perfect ending to an awesome but LONG day! 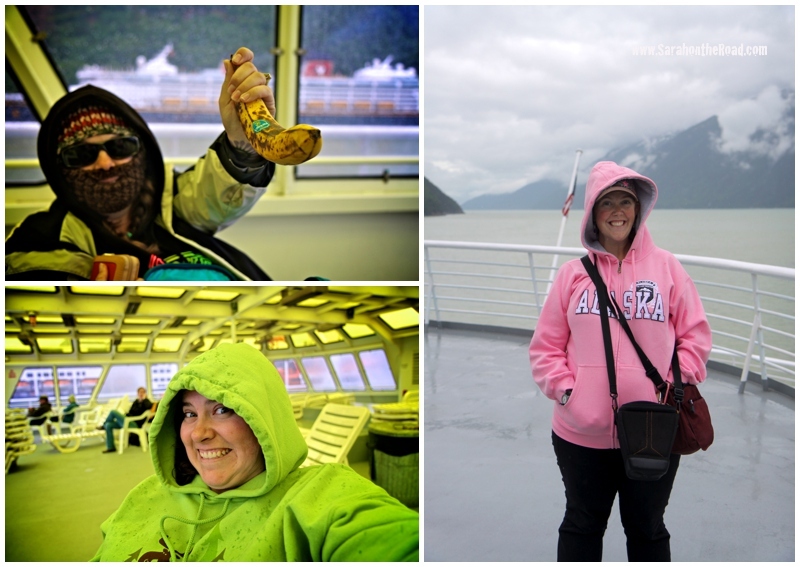 It started off with the Train ride, then a ferry ride and ended up with an awesome dinner! 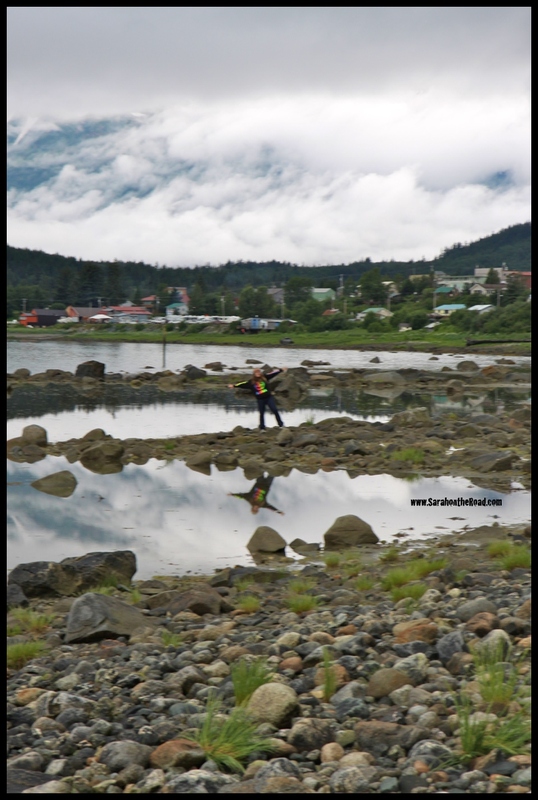 This entry was posted in Haines, Indigo's Ravens on June 30, 2013 by Sarah. 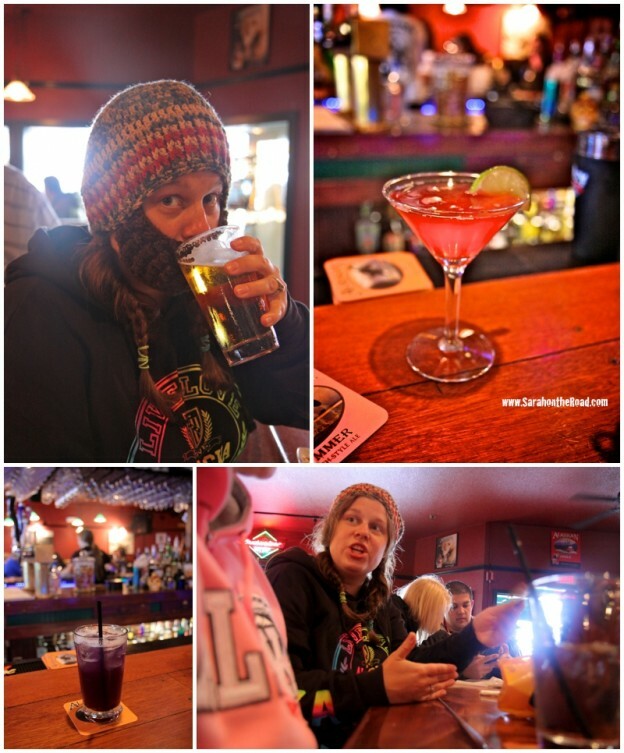 …after the train got back to Skagway we went out for lunch and some Birthday drinks for Jen! 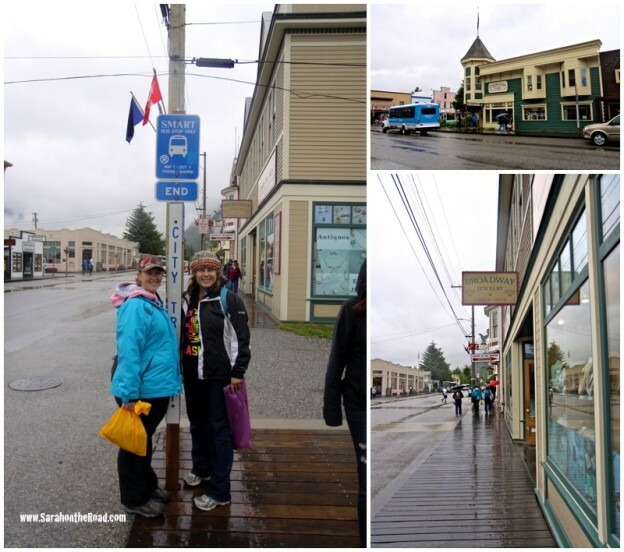 Then we wandered in Skagway and did some shopping… did you know that there are crazy amounts of jewellery stores in Skagway? it was like every other store was one! Who would have thought? 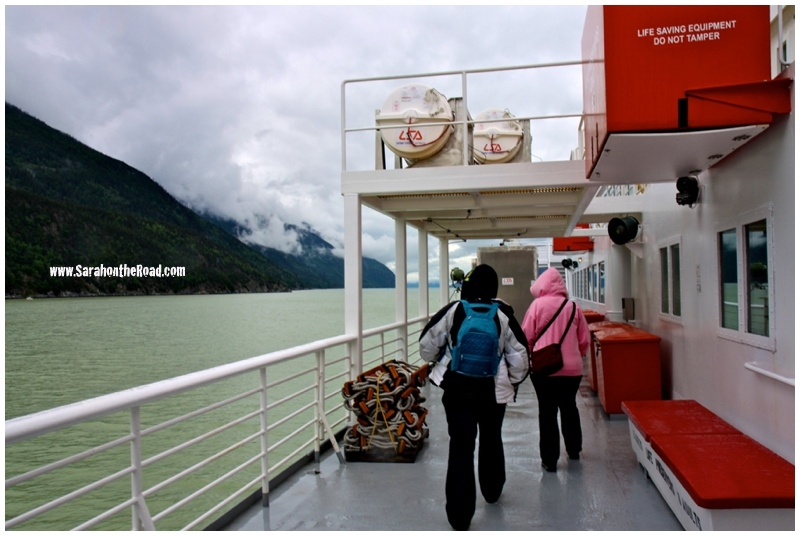 We got to the Ferry and checked in early.. so had to wait a bit…before we got onto the ferry. 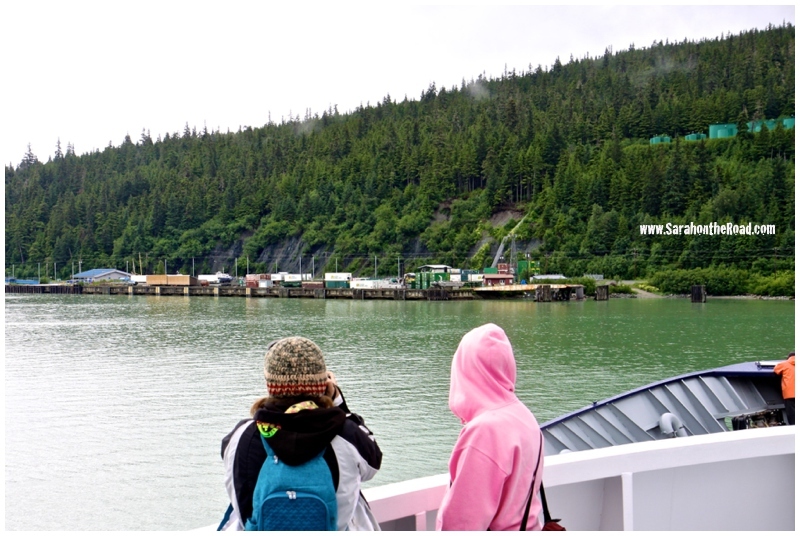 It might have been one of the slowest ferry loadings ever…because of the process of getting the cars/trucks/campers and trailers all into the right spots on the ferry! 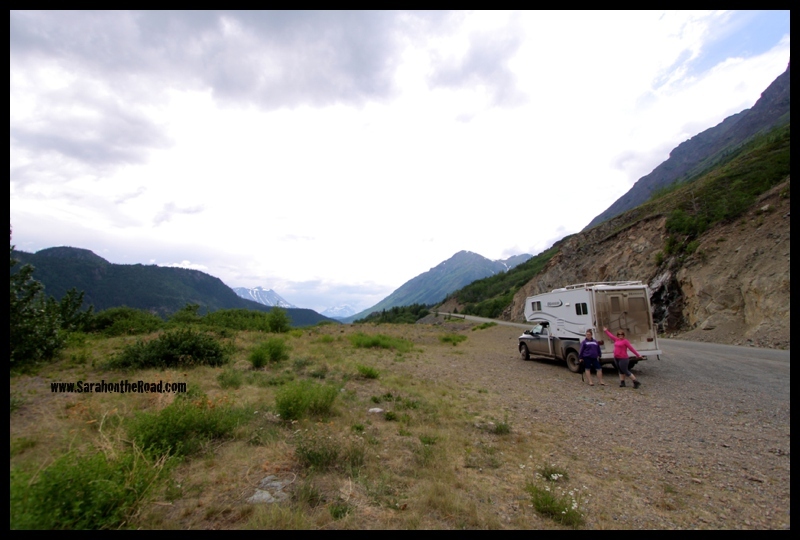 We just had a short ride of about an hour over to Haines, Alaska. 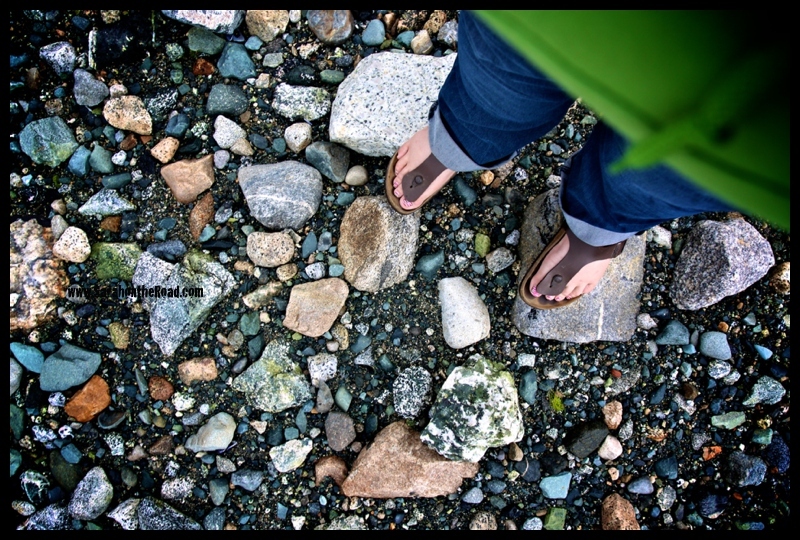 It was a fun just to wander and take photos for an hour! The weather was a bit rainy and cloudy…but this just added to the fun of taking photos. 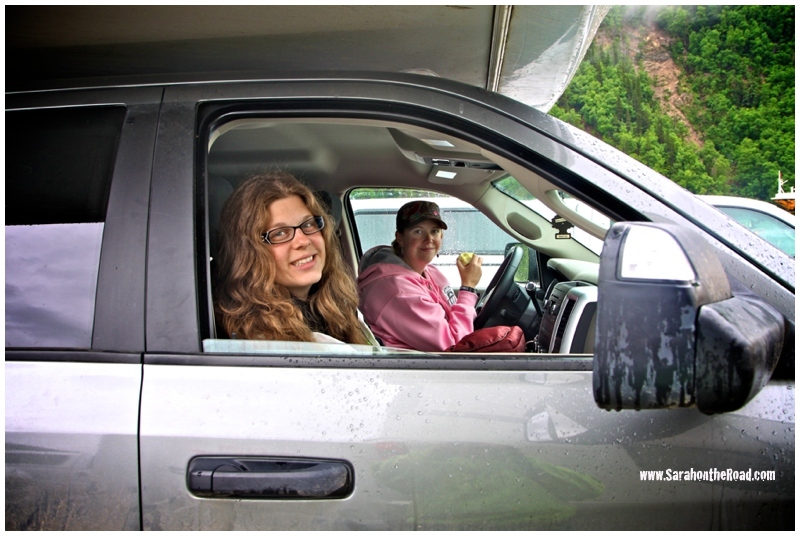 Arriving at the Haines ferry dock…so much fun! 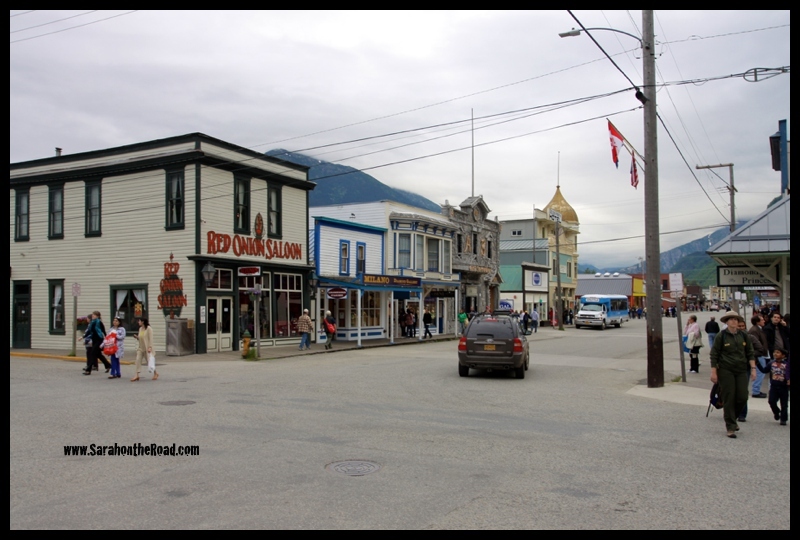 This entry was posted in Indigo's Ravens, Skagway on June 30, 2013 by Sarah. 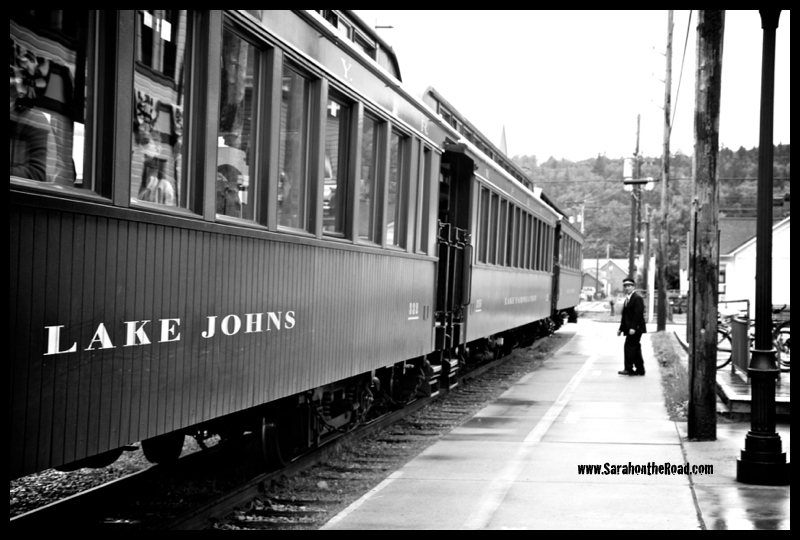 On Thursday, June 27th we headed to the train station. 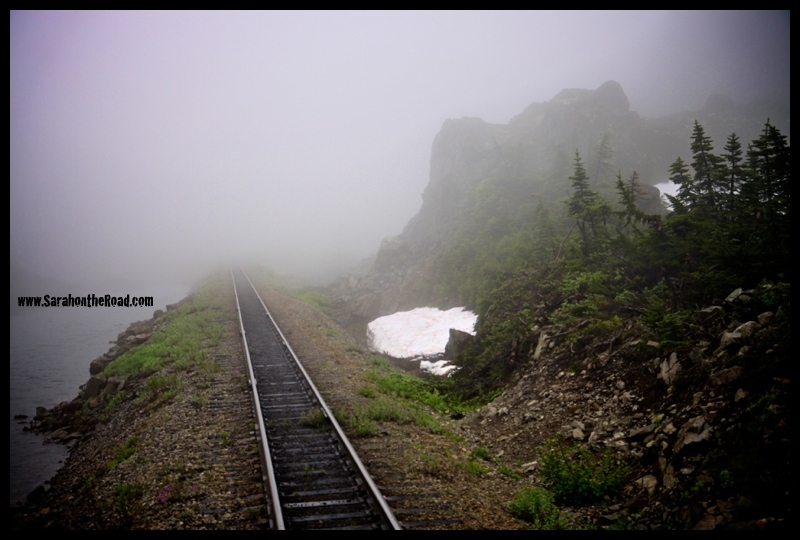 We took the train up to the Summit of the White Pass! It was a rainy morning but that didn’t stop us from having a fun day! 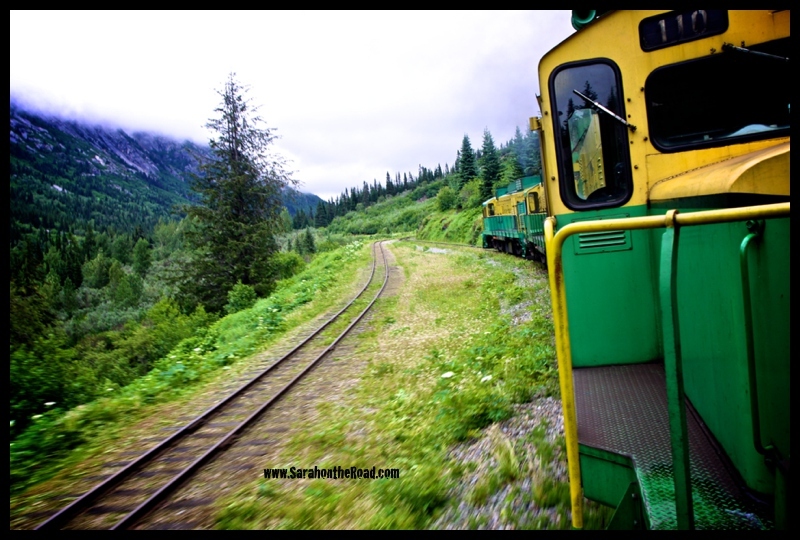 Built in 1898 during the Klondike Gold Rush, this narrow gauge railroad is an International Historic Civil Engineering Landmark, a designation shared with the Panama Canal, the Eiffel Tower and the Statue of Liberty. 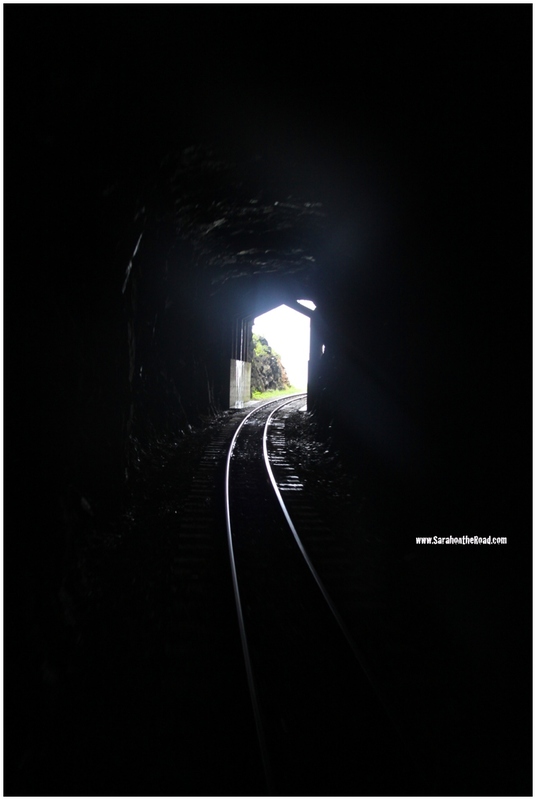 The WP&YR railway was considered an impossible task but it was literally blasted through coastal mountains in only 26 months. The WP&YR climbs almost 3000 feet in just 20 miles and features steep grades of up to 3.9%, cliff-hanging turns of 16 degrees, two tunnels and numerous bridges and trestles. The steel cantilever bridge was the tallest of its kind in the world when it was constructed in 1901. 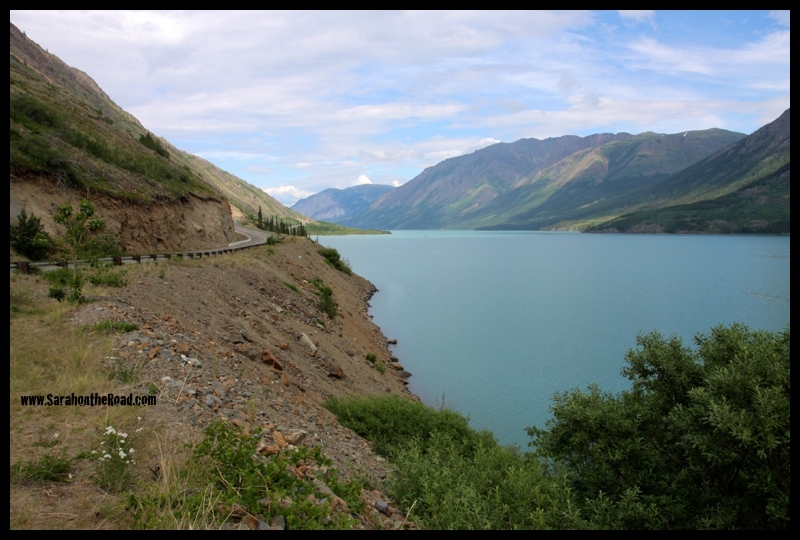 The 110 mile WP&YR Railroad was completed with the driving of the golden spike on July 29, 1900 in Carcross Yukon connecting the deep water port of Skagway Alaska to Whitehorse Yukon and beyond to northwest Canada and interior Alaska. 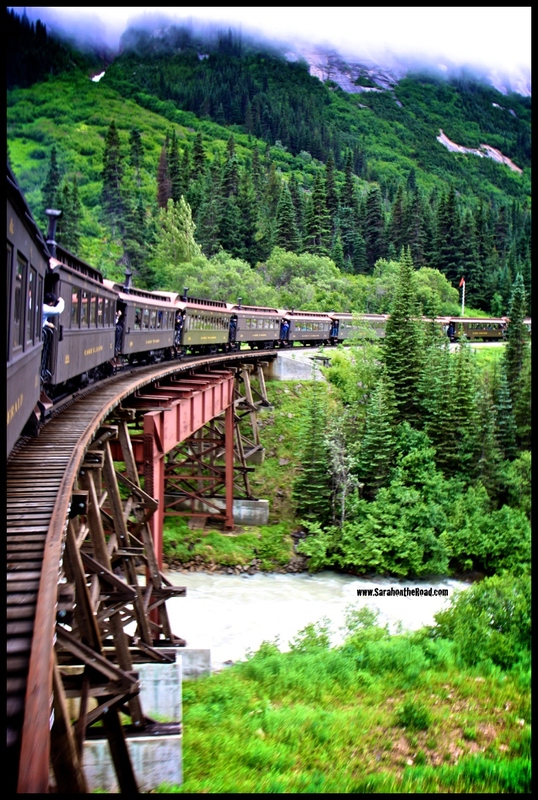 White Pass & Yukon Route became a fully integrated transportation company operating docks, trains, stage coaches, sleighs, buses, paddlewheelers, trucks, ships, airplanes, hotels and pipelines. It provided the essential infrastructure servicing the freight and passenger requirements of Yukon’s population and mining industry. WP&YR proved to be a successful transportation innovator and pioneered the inter-modal (ship-train-truck) movement of containers. The WP&YR suspended operations in 1982 when Yukon’s mining industry collapsed due to low mineral prices. 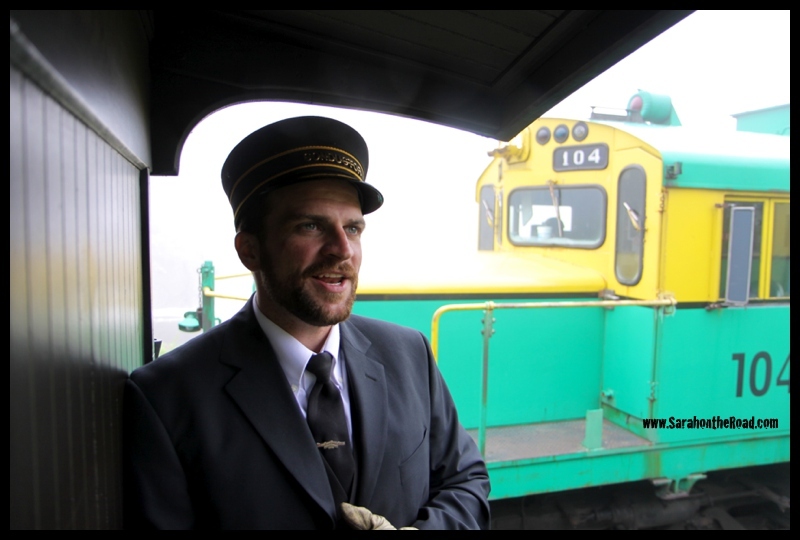 The railway was reopened in 1988 as a seasonal tourism operation and served 37,000 passengers. 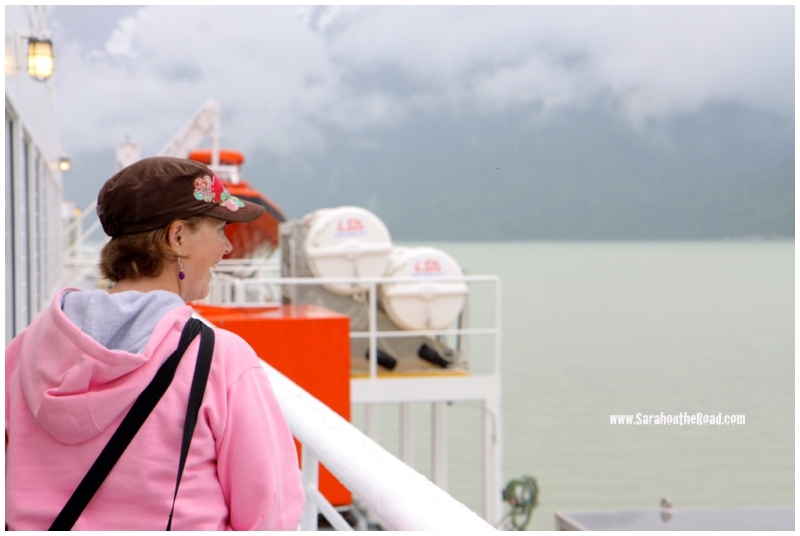 Today, the WP&YR is Alaska’s most popular shore excursion carrying over 390,000 passengers during the 2012 May to September tourism season operating on the first 67.5 miles (Skagway, Alaska to Carcross, Yukon) of the original 110 mile line. 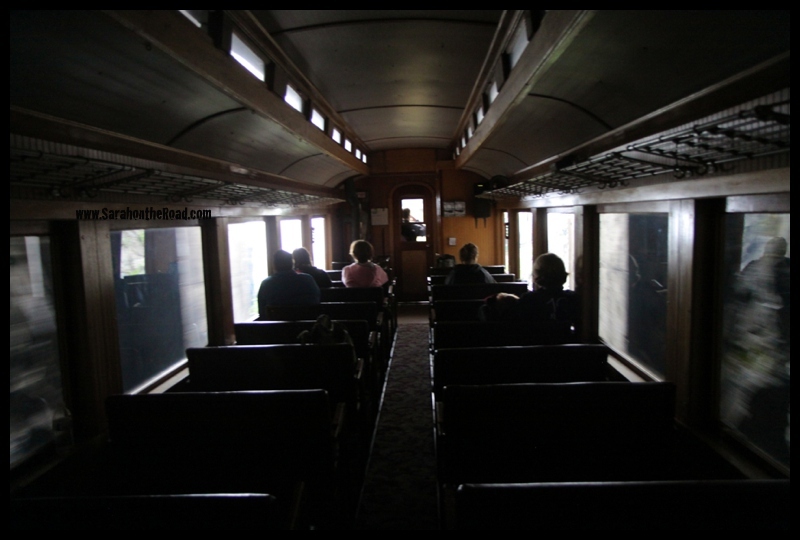 …I sat inside only for the first part of the trip, the rest of it I stood on the platform behind the engines on the way up…and was the last car on the way down! 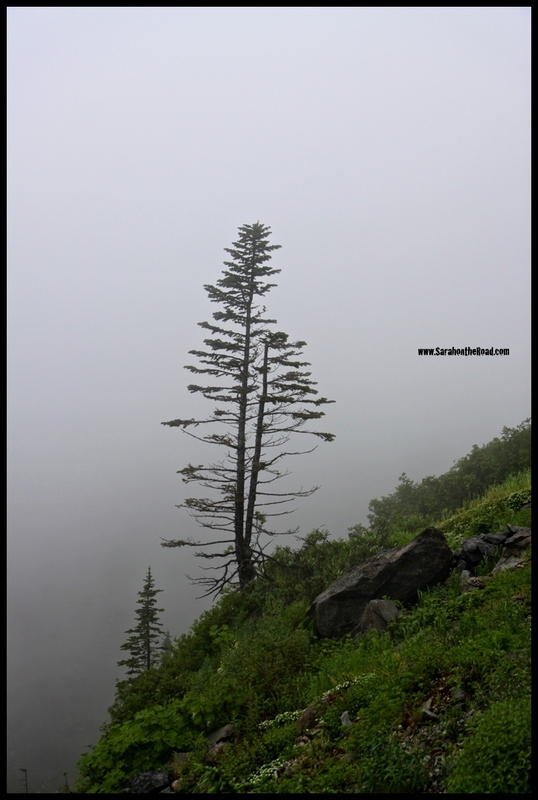 As we climbed the mountain…the fog got closer and closer until it was all around us! 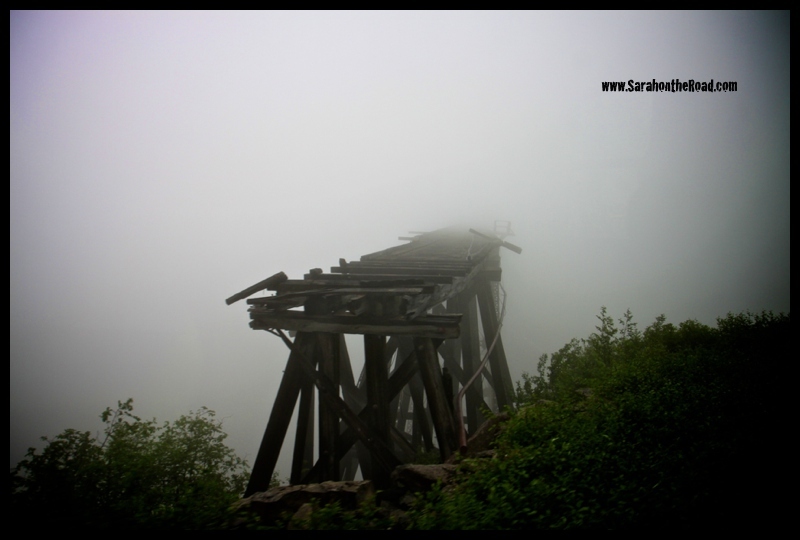 This is an old bridge…that is nicknamed the Ghost Bridge…can you guess why? 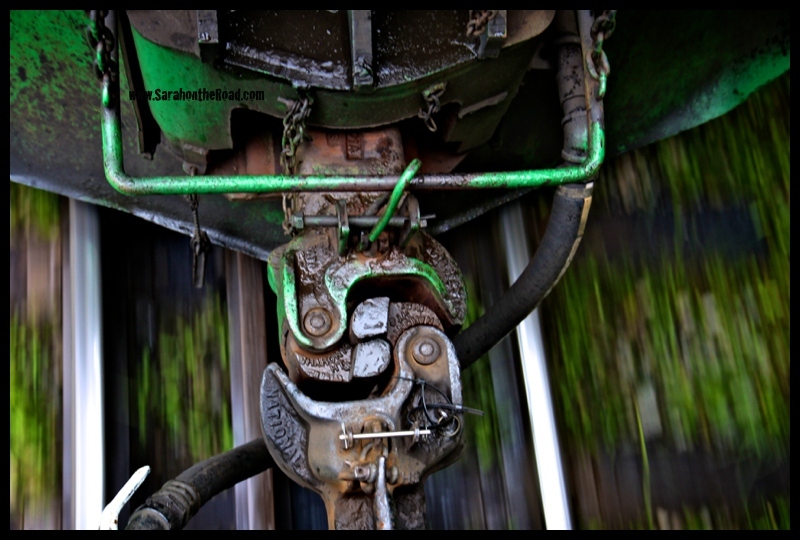 The Conductor…every train needs one! 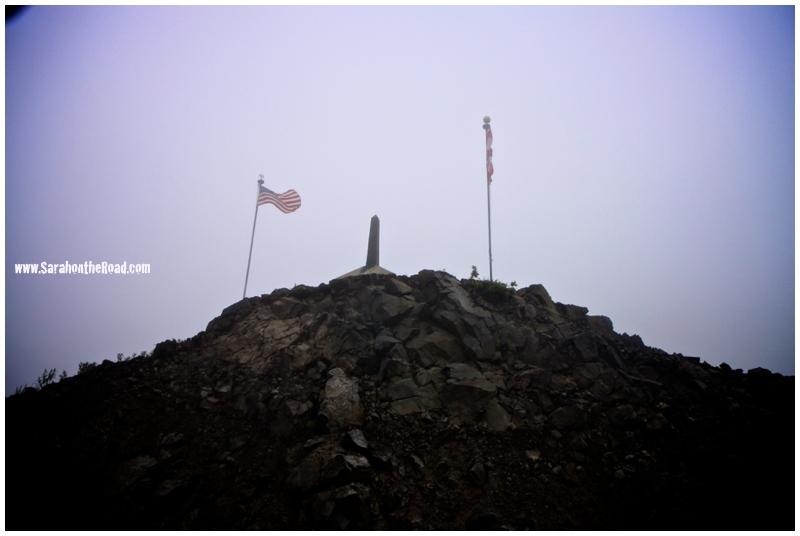 This is at the official boarder…which is also the Summit! 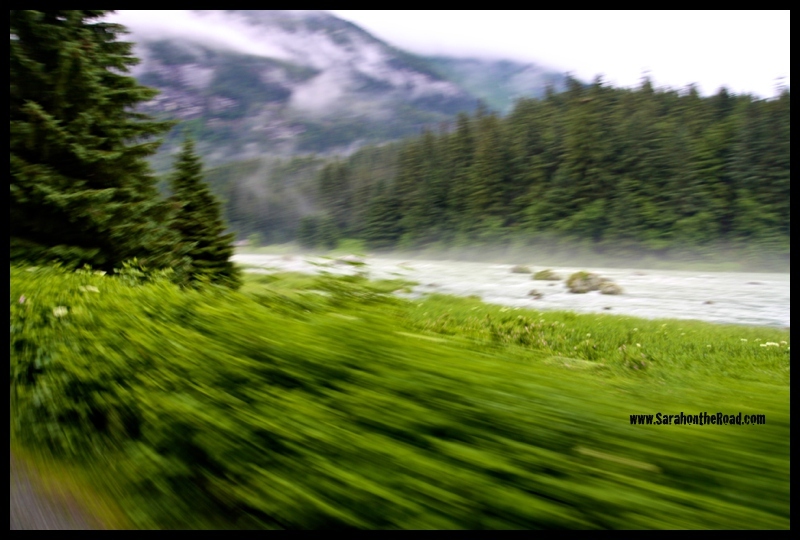 This is where the engines were switched to the other end of the train for our trip back down to Skagway. 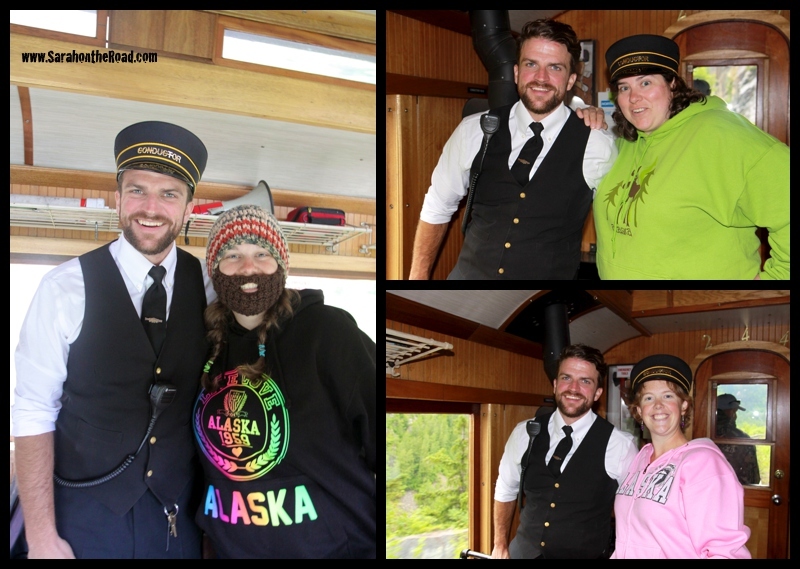 …we all got our photo taken with the Conductor. 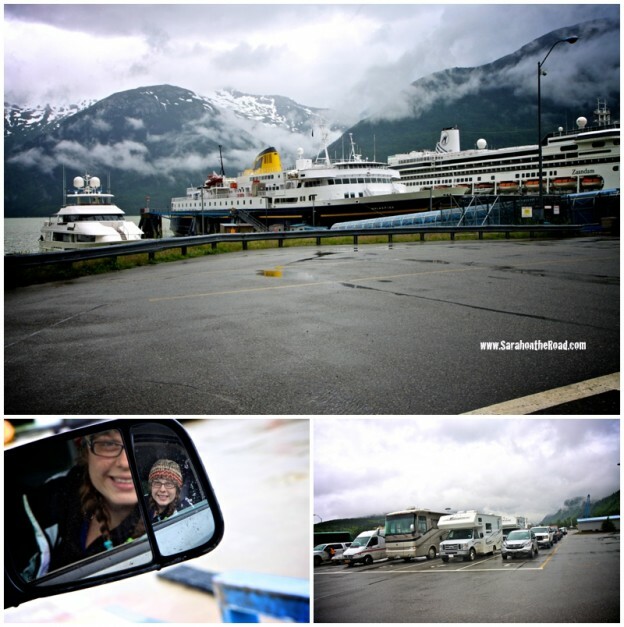 …and then we were back in Skagway…where the rain started to pour yet again! 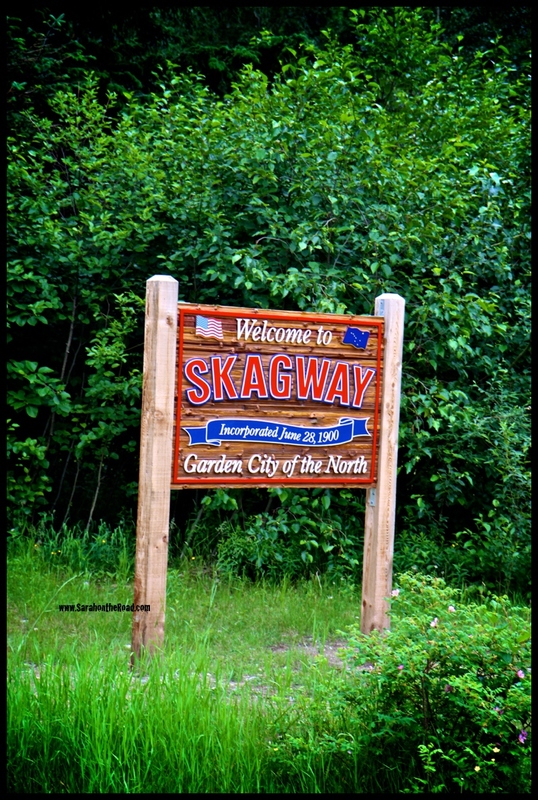 This entry was posted in Indigo's Ravens, Skagway on June 29, 2013 by Sarah. 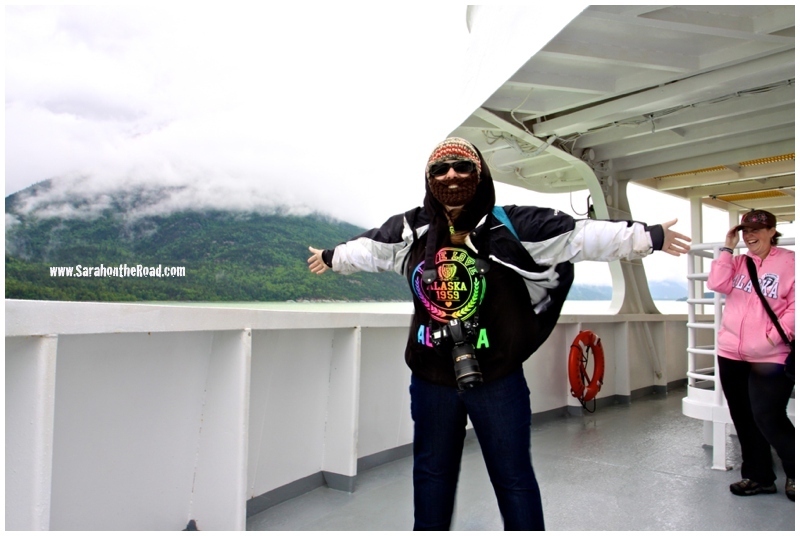 On the Road to Skagway, Alaska! 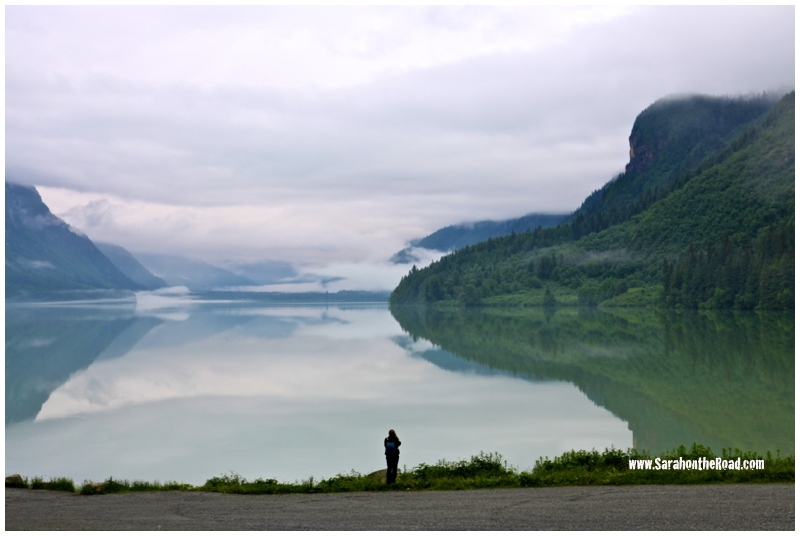 …after spending the night at Little Salmon Lake just a little ways from Faro we got on the road again! 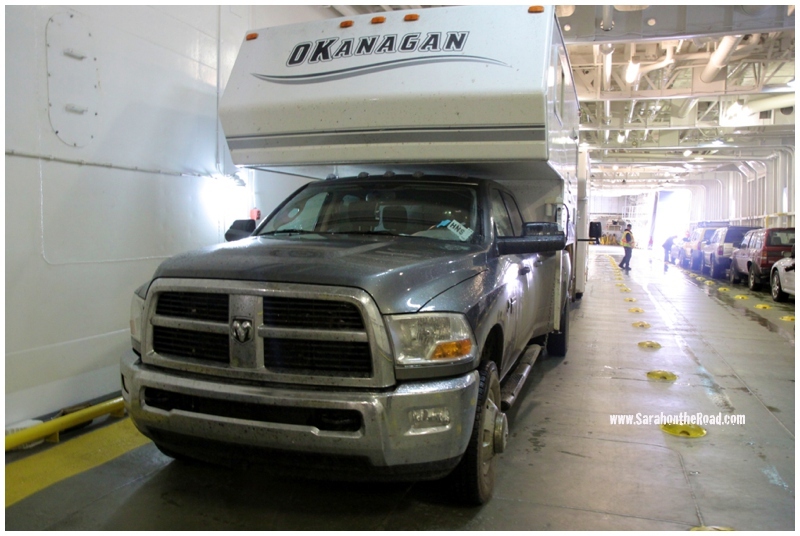 We had a quick stop in Whitehorse to get some cash and do a bit of shopping…then we were back on the road! 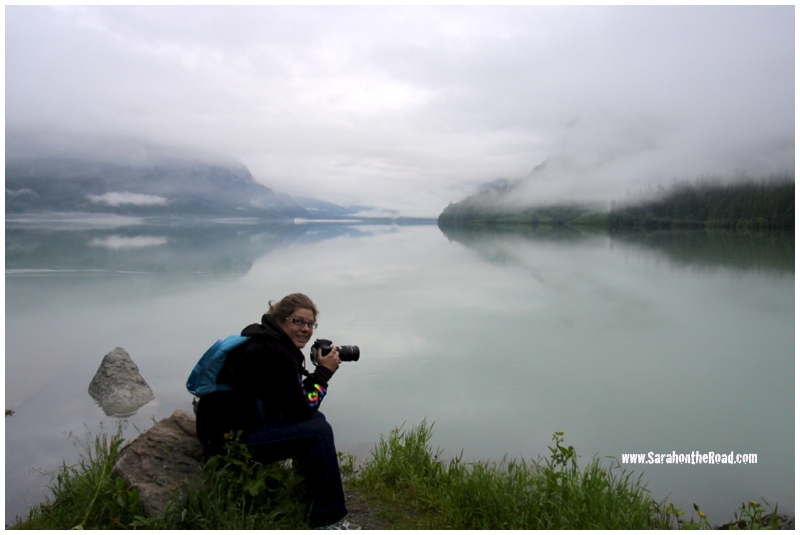 Our first stop was Carcross… it started to rain when we pulled off to take this photo! We didn’t let a little rain stop us as we explored the info centre and general store! 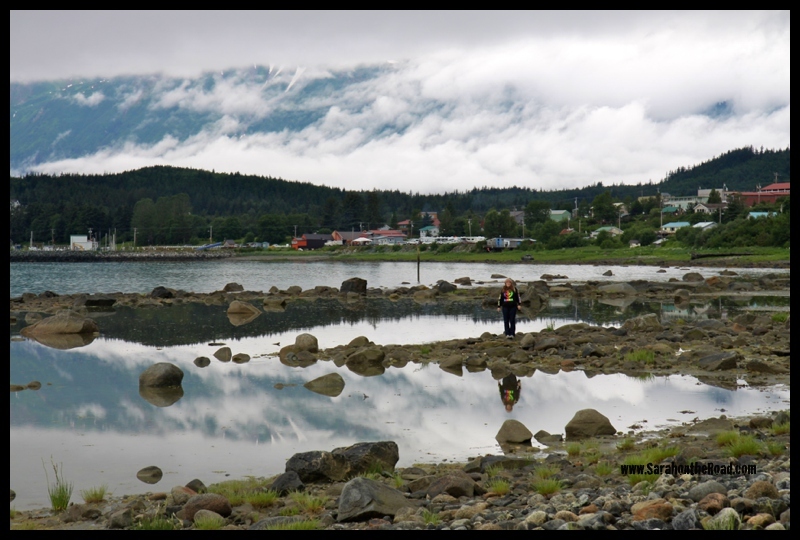 Jen just standing outside of the old ‘railway’ station…in Carcross! 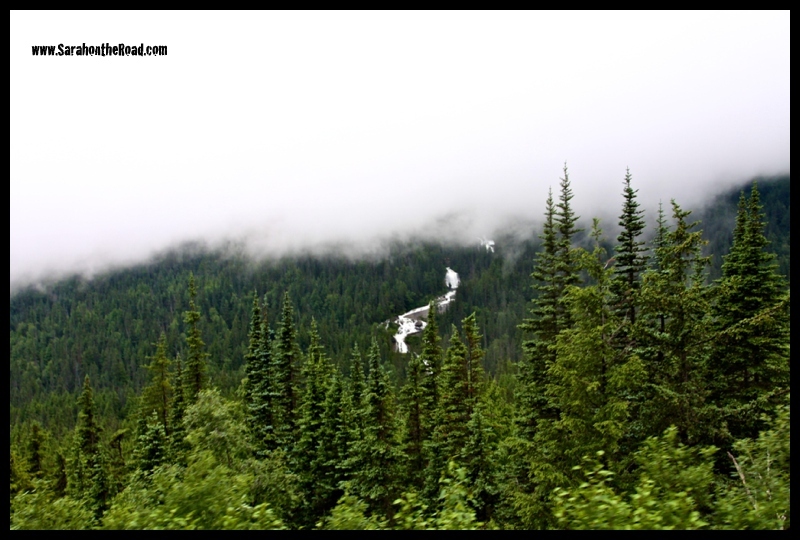 There was a lot of driving…and the scenery was stunning! 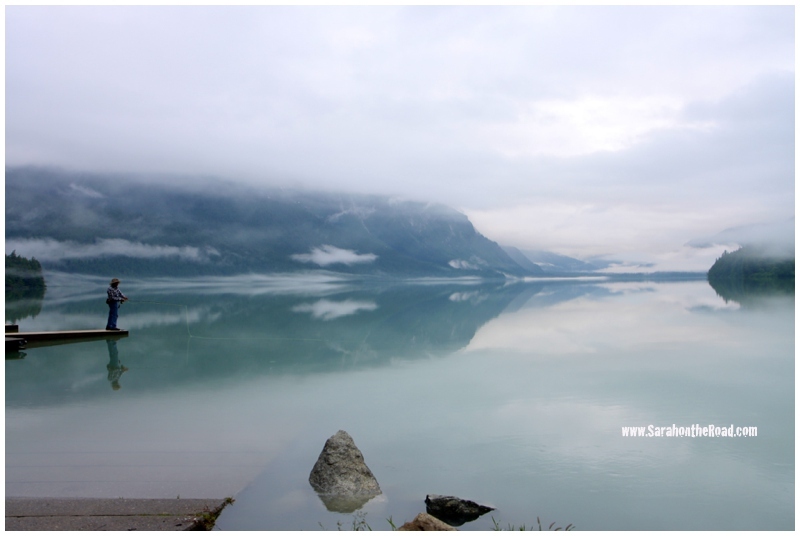 The mountains were so amazing… add it a bit of midst/fog and it made it even more magical. 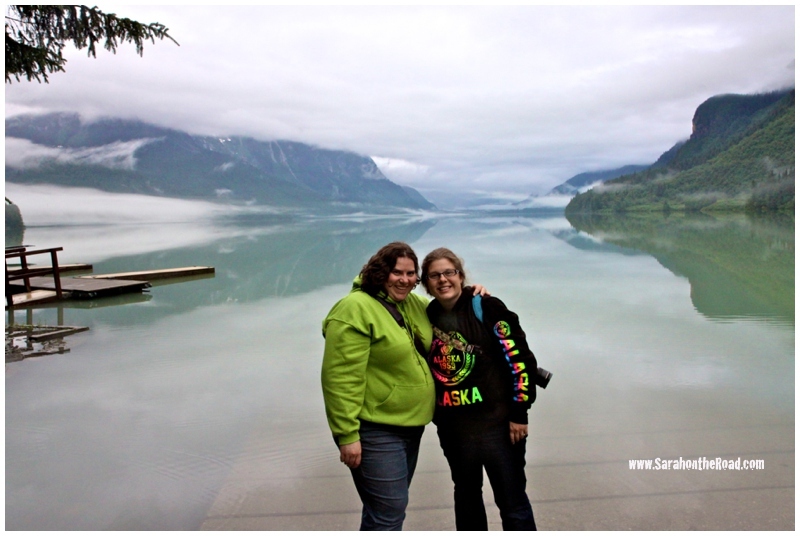 We did stop a few times to take in some of the ‘pull-outs’ so we could get out and walk around…. it was so gorgeous! 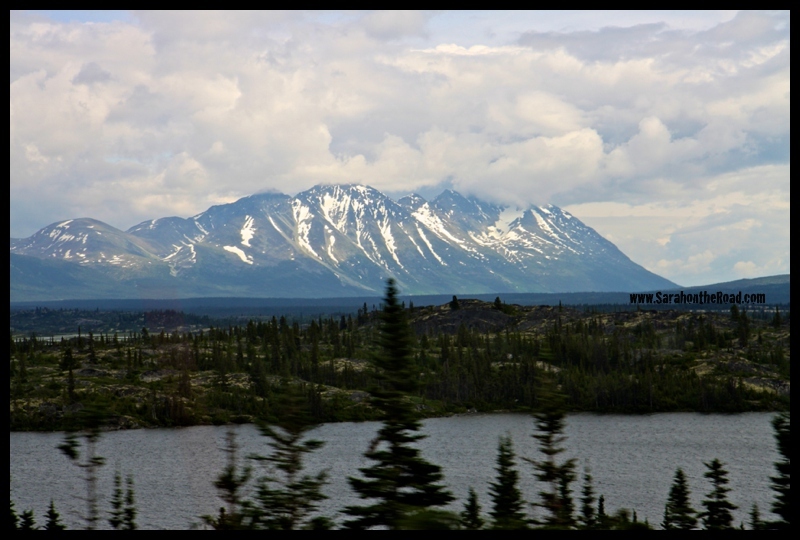 The thing I sort of knew but didn’t really realize was that to get to Alaska… we actually had to leave the Yukon and dip into Northern British Columbia…(go look at a map!) 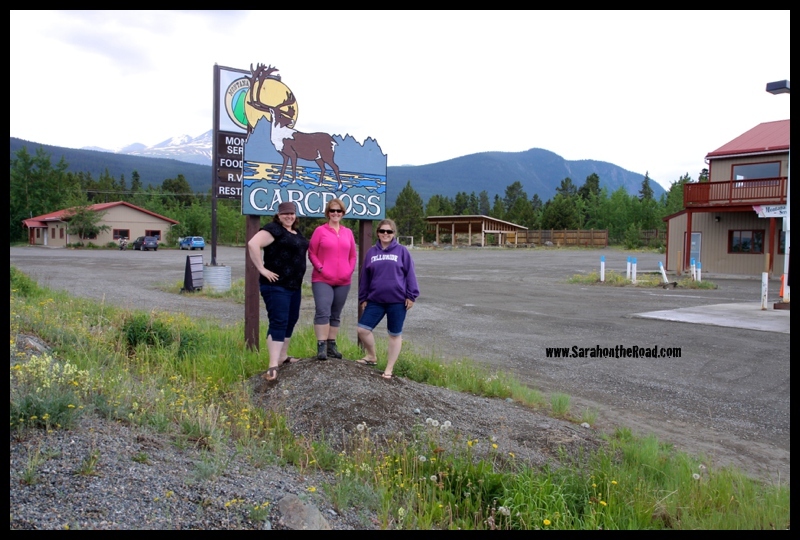 We passed through the boarder stop of Fraser, BC. 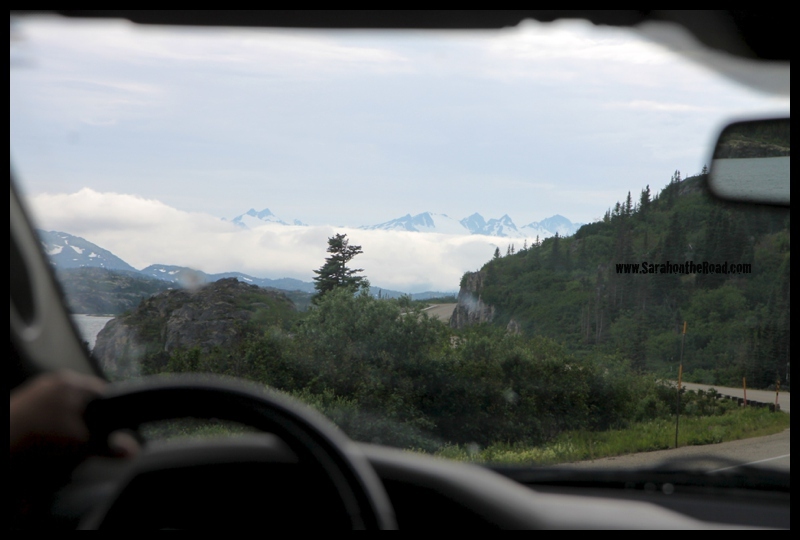 The drive over the last bit of the mountains was pretty fogged in… we were basically in the clouds! 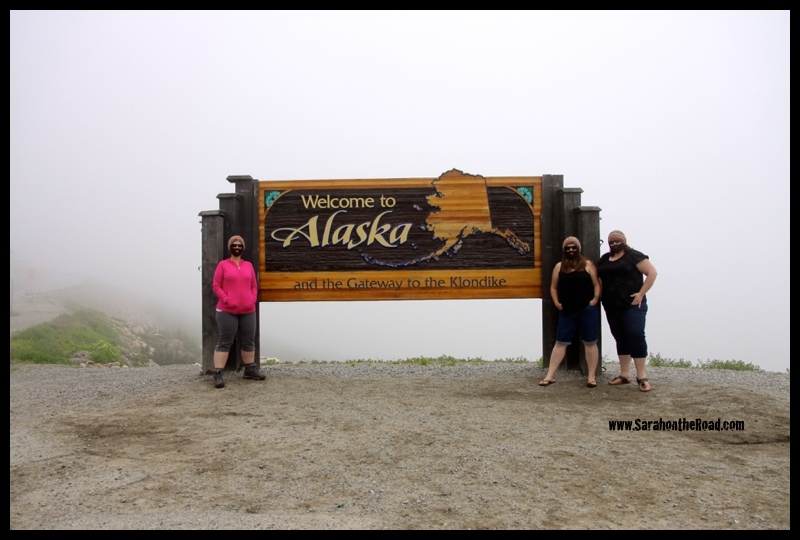 I was told that the view behind this sign is amazing… gorgeous mountain peaks… but it was a sky of white for us… kind of made the “white pass” name come true! 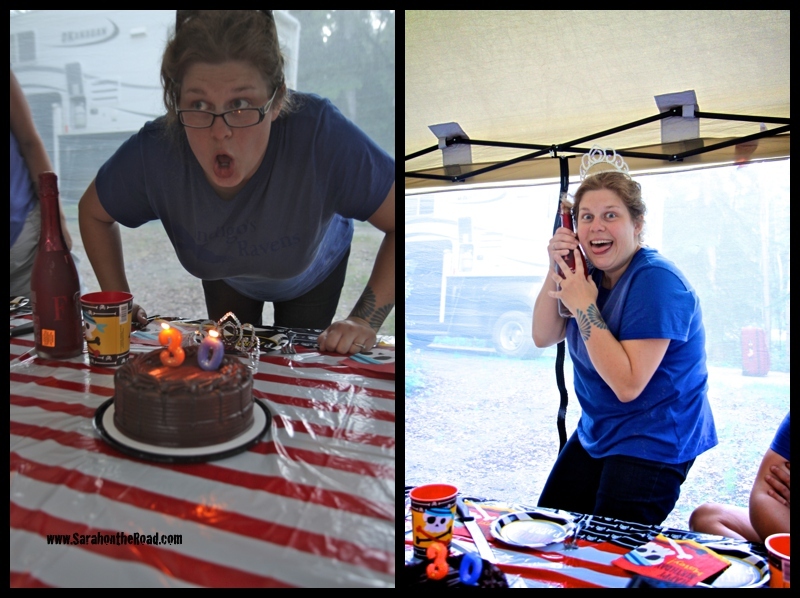 We got ourselves situated at our campground… then had a really fun night out on the town. We met a few new friends… and enjoyed our time at the Red Onion Salon.. the rain didn’t dampen our spirits at all! 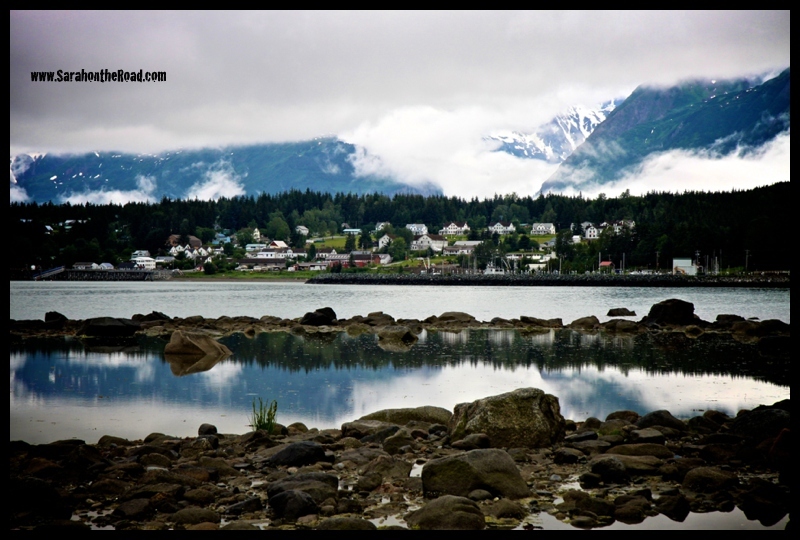 Stay Tuned for more adventures in Alaska! 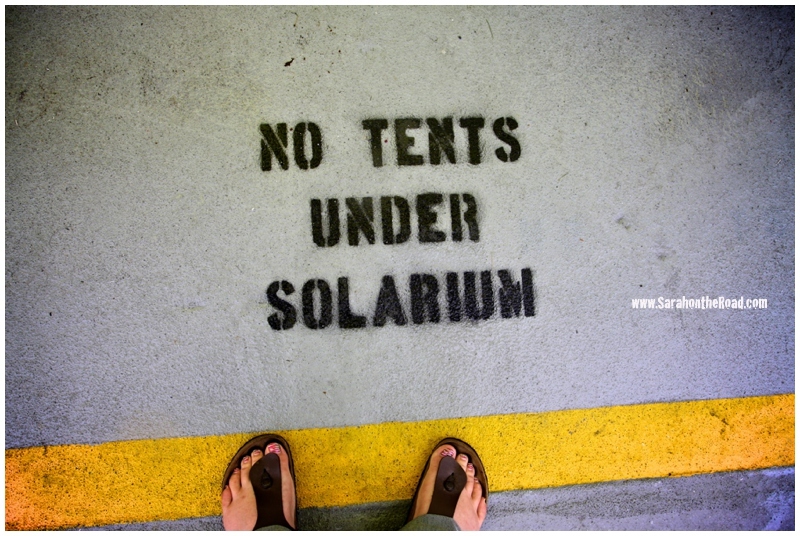 This entry was posted in Indigo's Ravens, On the Road on June 29, 2013 by Sarah. 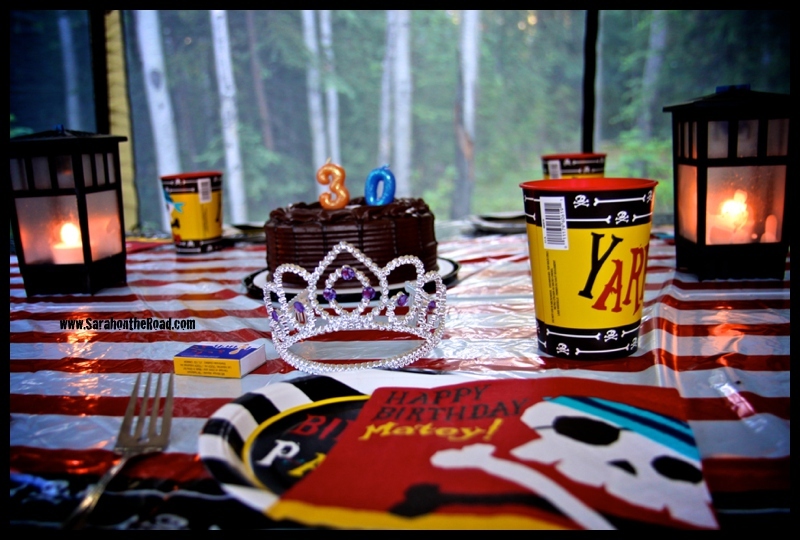 …we celebrated Jen’s birthday on our First Night when we camped all together at Wolf Creek… then we celebrated again when we were in Alaska! 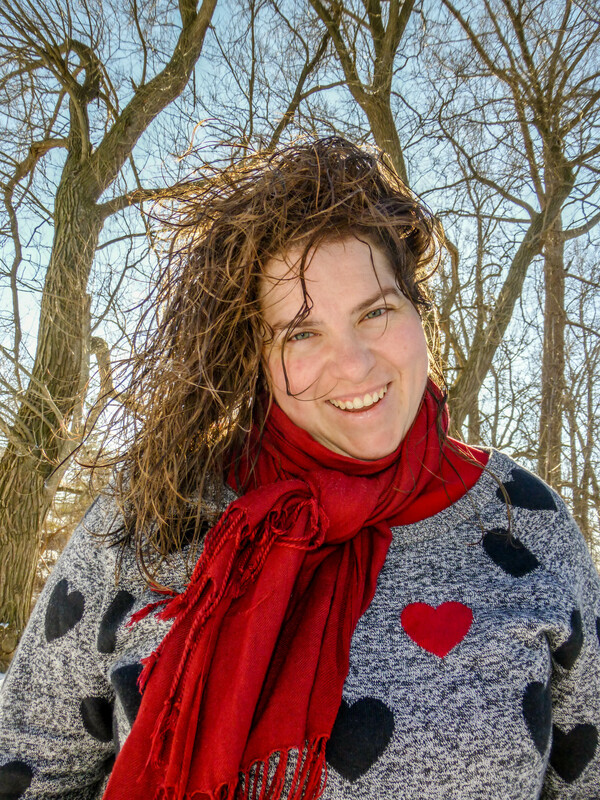 This entry was posted in Her Story, Indigo's Ravens on June 27, 2013 by Sarah.